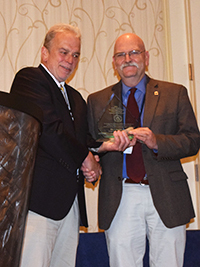 Dr. Chuck Peden (right) accepting the Distinguished Achievement Award from Dr. Steve Goguen, Program Manager for the DOE’s Vehicle Technology Program. Congratulations to Dr. Charles H.F. (Chuck) Peden at Pacific Northwest National Laboratory on receiving the Distinguished Achievement Award from the U.S. Department of Energy's Vehicle Technologies Program, part of the DOE's Office of Energy Efficiency and Renewable Energy. Peden is internationally recognized for his leadership in developing mechanisms of catalytic reactions that allow today's internal combustion engines to operate more efficiently and meet near-zero emissions levels for key pollutants. He is also well known for his work in establishing and building PNNL's Institute for Integrated Catalysis, the leading non-industrial U.S. research organization for catalysis research and development. Peden, who is currently on an interagency personnel assignment with DOE Basic Energy Sciences' catalysis science program, has written or contributed to more than 160 peer-reviewed publications on the kinetics and mechanisms of automobile exhaust emission control catalysis. For example, his group was the first to describe the enhanced performance of a new generation catalyst for the selective catalytic reduction of harmful nitrogen oxides based on a copper-containing small-pore zeolite in the open peer-reviewed scientific literature. Throughout his more than 35-year career, Peden has served the scientific community. He is a founding member of and the first person to chair a new Division of the American Chemical Society (ACS) that focuses on catalysis research. Also, he is active in and has served multiple programming and leadership roles for the North American Catalysis Society and the American Vacuum Society (AVS). For his technical contributions and service, Peden has been elected a Fellow of the ACS, the AVS, and the American Association for the Advancement of Science.